In the global attention economy, what might it mean to deploy “ugliness” to subversive ends? 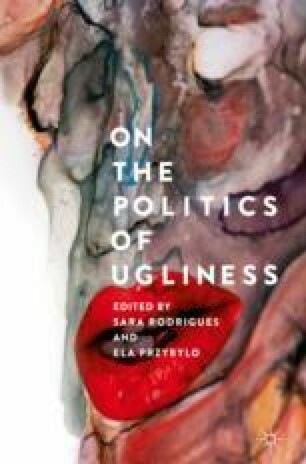 This chapter explores two feminist performance practices framed as strategic deployments of ugliness. The first is the performative practice and persona of contemporary musician Sia, who strategically denies visibility to her audience by refusing to reveal her face on stage. I will also explore a 2016 video installation created by Emma Sulkowicz, an artist and recent graduate of Columbia University who was raped on campus and famously constructed a senior thesis project and subsequent artworks around her experience. The chapter argues that both of these artists involve feminist deployments of “ugliness.” In the case of Sia’s work, they challenge contemporary regimes of visibility, fame, and self-branding. In the case of Sulkowicz’s, they disturb conventional protocol for navigating the interface between sexual fantasy, violence, cyberporn, embodiment, and political correctness. The chapter asks how both artists—by strategically withholding visibility or exploiting the voyeuristic potentials of the camera and making them available to an expanded audience online—rework the meanings of ugliness, embodiment, and community and in so doing, expand the boundaries of the political in the cyber age. The face has a great future, but only if it is destroyed, dismantled. I often think of this image, the photo that was never taken—one that only I can see now, and of which I have never spoken. It is always there in the same silence, remarkable. It is the only image of myself I like, the only one in which I recognize myself, in which I delight. The gap makes becoming possible.